Good news for buyers over the past few weeks, interest rates came down a few notches. That combined with the increased loan limit for conventional financing gave buyers a little boost. The new loan limit for conventional financing in Maricopa County is $484,350 as of a few months ago and the new limit for FHA financing is $314,827. Just 3 years ago, the limits were $417,000 and $271,050 respectively. The FHA limit increase hasn’t had as much impact on buyer demand as the conventional increase thus far. While the overall market is down 8.7% in sales this month, the biggest winner has been the $500K-$600K price range which is up 15%. “Buyer Season” in Greater Phoenix typically lasts from February to May with a peak in April. Sellers who decide to list their home in March should be aware that they have just 8-10 more weeks of peak buyer activity before the summer slowdown. This is a very competitive time for sellers. Price reductions are at their seasonal peak in the luxury price ranges, however it’s most noticeable in the battleground price range of $200K-$400K. 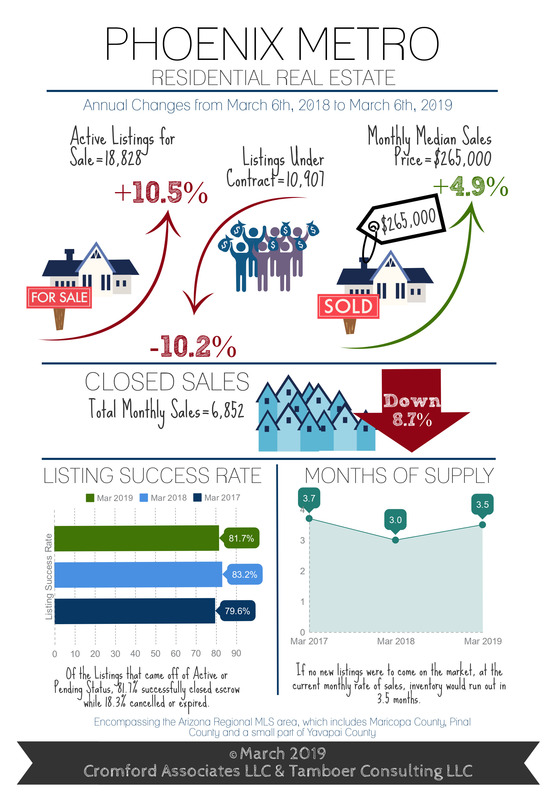 The number of weekly price reductions on listings between $200K-$250K are up a whopping 71% where competing supply is 32% higher than last year and price reductions are up 42% between $250K-$400K where supply is 26% higher. It’s a good idea to be competitive in both price and condition right out of the gate as buyer demand remains below normal overall in Greater Phoenix. This is not a good time for sellers to get caught up in timing the market so as to sell their home at the ideal “peak of price”. While it’s understandable for sellers not to want to leave any money on the table, the reality is that price peaks don’t happen in seller markets. They occur in balanced markets. Balanced markets are fine to sell in, but they’re not as fun or profitable for sellers as they expect; especially if their property is hard to sell due to condition or location. As the seller market continues to weaken, it’s more important than ever for sellers to list their property while they still have the advantage of low competition, price it competitively and don’t spit on the first contract. Buyer activity, while lower, will continue to accelerate through May. This is go time. The monthly average interest rate rose to 4.64% in December 2018, up 0.69% from the previous December’s 3.95%. For buyers who will purchase at the current median sales price of $260,000, that equates to approximately $100 added to their monthly payment compared to last year. Buyers averaged 1,845 square feet at this price; nearly 100 square feet smaller than if they had purchased last year. It doesn’t help matters by renting either. As single family homes appreciated 8.1% per square foot, single family lease payments also rose 8.6% during the same time frame. With that, buying is still a good option over renting if only to stabilize one’s monthly housing expense. Sale prices will continue rising in the first half of 2019, but at a slower rate and they’re not expected to decline at this juncture. Instead, buyers may see a little more flexibility from sellers in the form of repairs, closing costs, and possibly interest rate buy-downs in the higher price ranges. The market continues to favor sellers entering into 2019, but not nearly as much as it did at the beginning of 2018. Supply is still 34% below normal compared to 36% below normal this time last year. It’s buyer demand that has shifted as buyers grapple with affordability and concerns about an overvalued market. Demand at this time last year was measured 1% above normal; today it’s 13% below normal. While it may feel like a buyers market compared to the last four years, it is far from one. Greater Phoenix is still in a seller’s market, however it’s weaker out of the gate. This means there is still more demand than supply, but multiple offers will not be as common, there will be fewer sales overall and scenarios will vary widely depending on price range. Demand could change in either direction depending on interest rates, however for the time being buyers and sellers have to play the hand they’ve been dealt. For those wondering if it’s still a good time to sell, the answer is “yes” for now.